Despite temperatures in the low 40s and a string wet north wind, 10 people joined me yesterday morning for the monthly group walk. We met at the Parmer Village end of Lake Creek Trail where there were more birds in the drainage pond there than I've seen in a long time: Great Egret, Great Blue Heron, Snowy Egret, a few Gadwall, an American Wigeon, and a single sleeping Pied-billed Grebe. After that strong start things slowed down and we really didn't see much on our way upstream to the last dam. At the dam we watched about 6 Barn Swallows catching insects over the water. I hope these early spring migrants are keeping warm! We found a single Ruby-crowned Kinglet and a few Yellow-rumped Warblers by the dam as well, winter resident species that will soon return north. In fact, I think Yellow-rumped Warbler numbers are already decreasing in the Austin area. We continued upstream paralleling the trail through the woods, but we didn't see or hear much. We were well into the Town and Country property before we finally found a neat flock of about 15 Chipping Sparrows foraging on the ground behind a little hill that shielded them from the cold wind. The group was getting cold as well and several people turned back at that point. But most of us toughed it out and made our way to the first low water creek crossing. 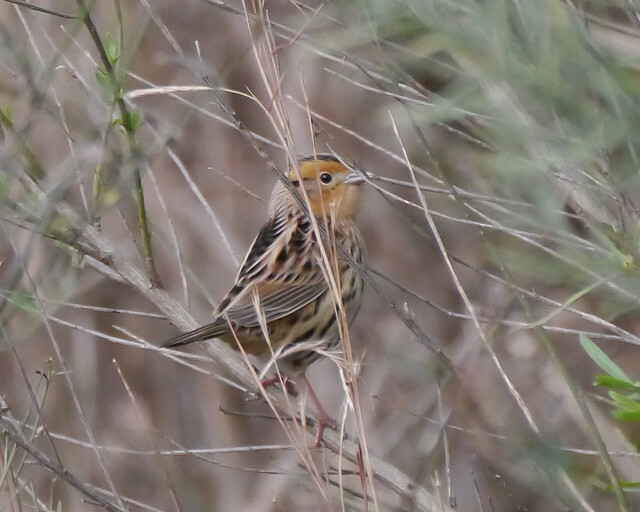 Down by the creek we found a little break from the wind and got to see an American Pipit on the creek bed and a Savannah Sparrow in some dense brush along the bank. Then we hoofed it back to the parking area by the pond. Although it seemed like a slow morning, we managed to detect 45 species of birds. Here's our complete eBird list. And here's one more photo of Flickr, a part of a beaver skull we found near the Parmer Lane bridge. Yesterday morning about 20 people joined me for my monthly group walk on Lake Creek Trail. It was foggy but not too damp when we started at the Braes Valley end of the trail at 8:00 AM. Things started a little slow but we ended up having a fun morning, spending 3 hours on the trail and finding 41 species of birds. Sound travels faster and farther through fog, and we felt like some of the birds singing the morning chorus were almost on top of us even though we had trouble seeing them at first. We checked the side trail that connects to Holbrook St. and we were rewarded with brief looks at a male Spotted Towhee, an uncharacteristically colorful member of the sparrow family, and longer easier looks at a Ruby-crowned Kinglet. Back on the trail we didn't see much until we got to the footbridge where we first heard and then saw a pair of Red-shouldered Hawks in neighbors' yards near the end of Meadowheath. And a few of us got a brief look at a Swamp Sparrow. These days my neighbor Steven McDonald birds Lake Creek Trail more often than I do. 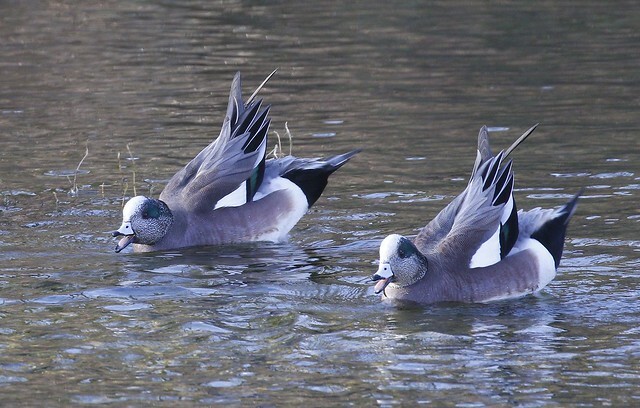 He's even challenging himself to try and observe as many species of birds on Lake Creek Trail as possible during the calendar year of 2019. 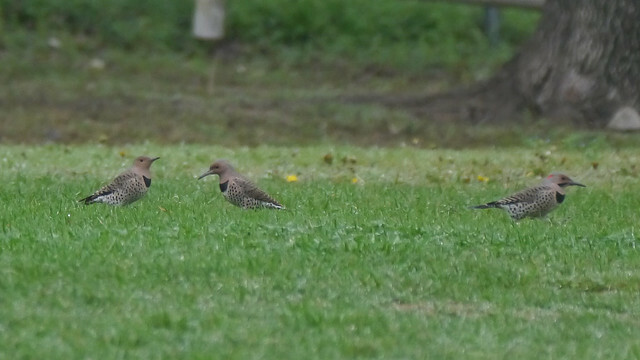 (Birders call this a "big year.") Lucky for us he's a great photographer as well as birder, and has recently found and photographed some really cool birds on the trail. Many birders including myself enjoy starting the new year birding. There's something undeniably fun about wondering what your first birds of the year will be. This morning I slept in, and I think the first bird I perceived in any way was an American Crow that I heard cawing while I was still laying in bed. I finally got out of the house around 9:20 AM with the plan to do some "street birding." 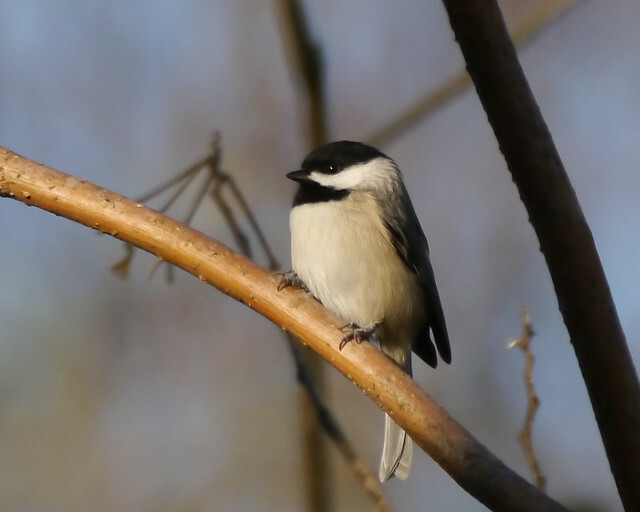 Our neighborhood has so many mature native trees that you can find great birds just by walking the streets, especially in the winter when year-round and winter resident species come together in mixed-species foraging flocks. After initially hearing some Blue Jays and an Eastern Phoebe call note, the first birds I actually laid eyes on were American Goldfinches, a distant small flock of about half a dozen birds making their "tutu, tututu" call as they flew between treetops. These were just the first of dozens of American Goldfinches I encountered, mixed with dozens of Cedar Waxwings and American Robins mostly just west of Broadmeade between Chesterforest and Shady Oaks. There were lots of other cool birds with them in smaller numbers, including most of our expected winter-resident songbirds. Species I was most excited to find were Yellow-bellied Sapsucker (a beautiful mature male), Pine Warbler, Golden-crowned Kinglet, Red-breasted Nuthatch, and Pine Siskin! 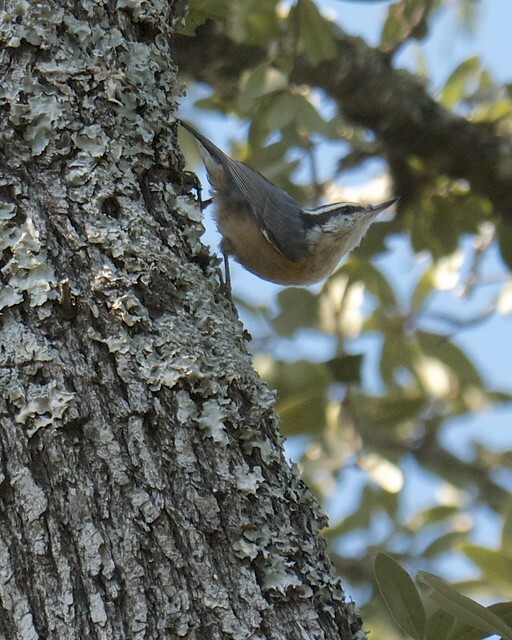 The nuthatch was in the same area I'd seen one a couple weeks ago, near Stillforest and Hazelhurst. I unexpectedly found 3 sparrow species (White-throated, Song, and Lincolns) in the reeds of the tributary creek that Broadmeade crosses just north of Meadowheath. I covered about 2 miles in a little under 2 hours and found 34 species of birds. Here's my complete bird list on eBird. This morning ten people joined me on the monthly group walk. It was cold and clear when we met at 8:00 AM at the Braes Valley parking lot. We spent about 3 hours covering 1 mile on the trail and as a group observed 42 species of birds. And we enjoyed beautiful clear conditions and morning light. Here are some highlights. A little further down the trail we started hearing the "vree" call of a Hermit Thrush, the first I've heard or seen this season. We played a recording of its song and this normally hidden bird that prefers low dense brush in the woods came out and flew by us several times looking for the source of the song. Unfortunately it never gave us a good photo opportunity. There was a fair amount of activity including Yellow-rumped Warblers, White-throated Sparrows, Northern Cardinals, and a few other species but getting good looks at them was difficult. Then from across the creek there was a large flight of White-winged Doves and a minute later we spotted a Cooper's Hawk flying through the canopy. 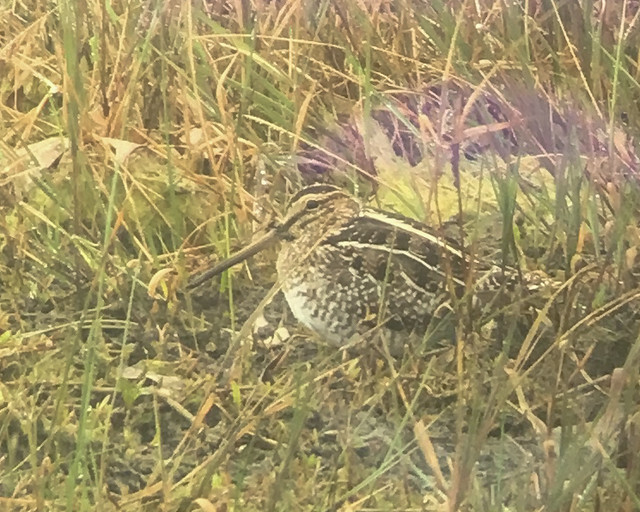 We then noticed that nearly all the birds were silent because of the close proximity of this avian predator. The subdued activity lasted for a long time, and we were approaching the footbridge before things seemed to return to normal. We got some brief looks at a Brown Thrasher in the dense trees and shrubs between the trail and the creek. And then I looked up and was stunned by the fall color of a cedar elm tree in the angled morning light. The leaves looked almost electric! About a dozen people joined me for the monthly group walk this morning. We started at the east end of Lake Creek Trail by the Parmer Village pond. It was cold and windy initially but the sun came out and it became a beautiful morning. Here are some highlights from the walk. The pond was pretty quiet, with a few Double-crested Cormorants and a Loggerhead Shrike being the most interesting birds. We made our way to the creek bed and began walking upstream. A heard-only House Wren chattered at us when we first went off trail. And there were a few sparrows around but most couldn't be seen. 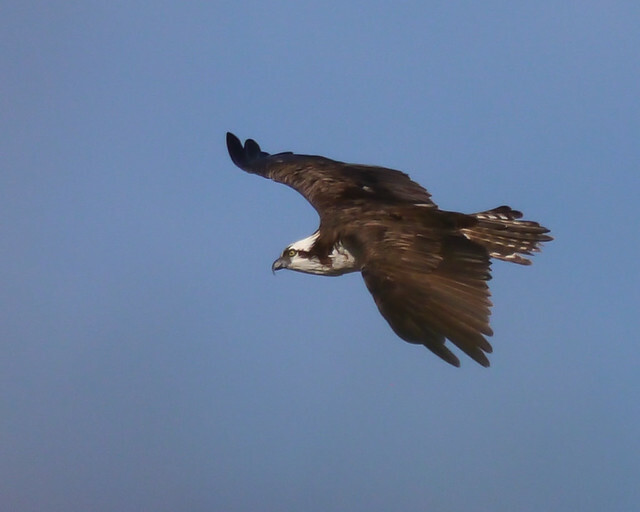 We briefly saw an Osprey flying low over the creek up by the last dam. And a little later we saw it again. It was headed our way and flew right over us! Here it is again, head-on!